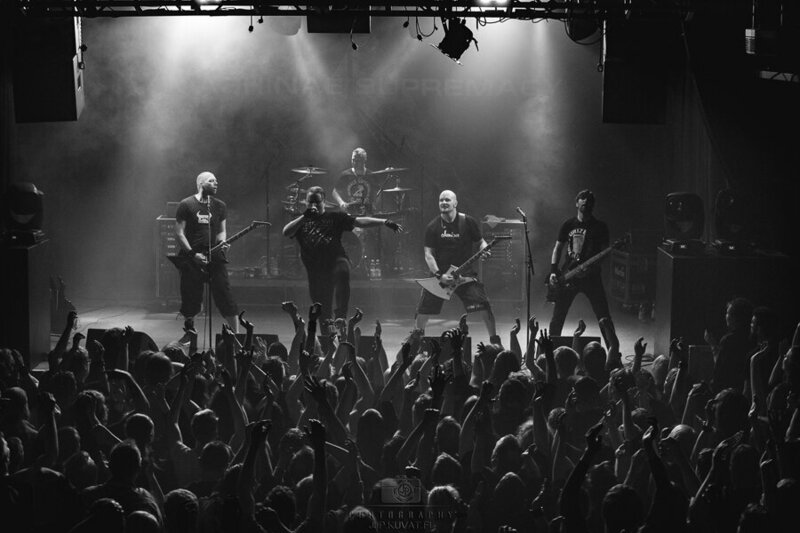 Sweden’s Machinae Supremacy doesn’t need much introduction in Finland. 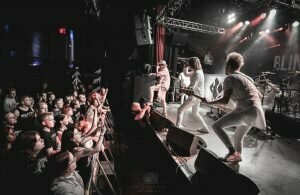 Hailing from Luleå, this nerd squad combines old Commodore 64 era sounds with metal, and tours extensively in our country, most of the time to near-sold-out venues, even though the more mainstream media still doesn’t recognize them. 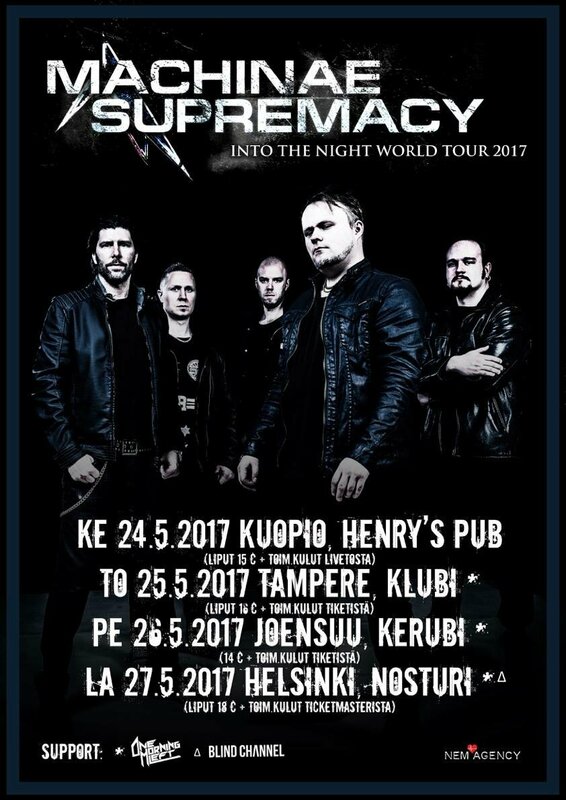 Having released their new Into the Night World album at the end of last year, the band did a whole spring tour in Finland, traveling through Kuopio, Tampere, and Joensuu, ending at the ever-so-welcoming Nosturi in Helsinki on May 27th, marking their fifth time performing there in this decade. The metalcore party unit One Morning Left was traveling as support, with Blind Channel joining exclusively for this show. Why not! As always, I was almost late by arriving only a few minutes before One Morning Left’s showtime at 20:30. The front of the stage was divided surprisingly unevenly, regarding the attending minors, as only a few meters of space was left outside the bar’s fence. The small area was already filled with people, including the five (or six) girls that seem to follow Blind Channel wherever they perform, when the bar was basically deserted, with maybe 10-15 people. I barely got to order a beer before One Morning Left climbed on stage with a chiptune intro track and began their 30-minute set. One Morning Left is one of those bands that I have absolutely nothing in common with, but this doesn’t mean that they aren’t entertaining live. The band’s chaotic metalcore, reminiscent of bands like Attack Attack!, is the type of stuff all metal purists just have to hate out of principle, even though the world is full of much more indifferent heavy music. 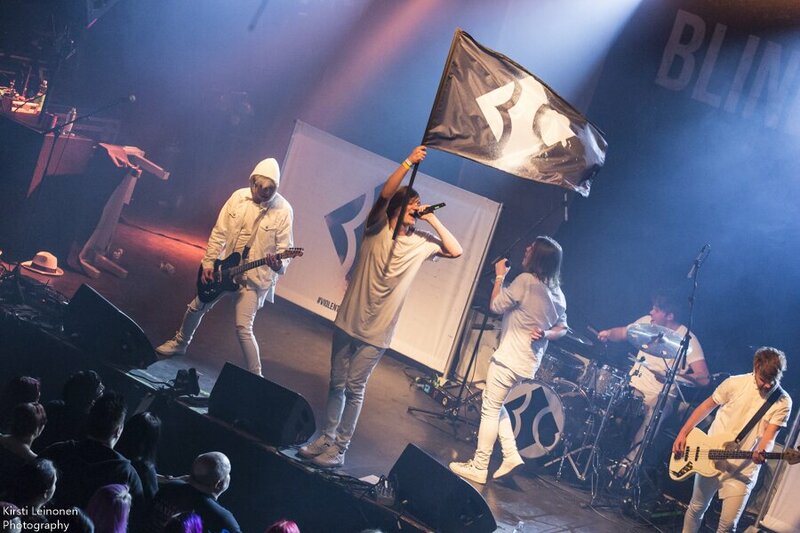 The last time I saw these guys live was at EDGE:Nordic last fall, and in the course of these 8 months nothing has changed – the stage was still packed with action, the band surely can play, and there’s more going on within a single song than most metalcore bands can come up with on a whole album. One Morning Left’s material isn’t that familiar to me, but I think that the pure all-over-the-place-ness of their early material has been toned down a bit in their more recent work. The stage was plenty busy, including the unsuspected attack of three dancing girls, familiar from the latest season of Temptation Island Finland, armed with water guns. 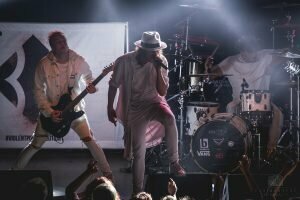 A special mention still goes to vocalist-guitarist Leevi Luoto, who completely overshadowed the main vocalist Mika “Misku” Lahti with his energy – Lahti’s microphone seemed to have a pretty bad volume level, though. As a whole, the show was fairly decent, and a good deal of people had arrived mid-set. 7. You’re Dead! Let’s Disco! And now for something completely different: Blind Channel has made excellent progress during their short career, as the band – founded in 2013 – has already had a show at Wacken Open Air after winning their Metal Battle contest, and after last year’s debut, Revolutions, they’ve toured a fair bit both in and out of Finland. At 21:20, Blind Channel took the stage dressed completely in white and fired away with their almost obnoxiously catchy material for a good 45 minutes, and were welcomed with the loud screaming coming from the front row. I don’t know what was wrong, but without counting the girls out front of the stage, Blind Channel had considerable difficulty getting the audience warmed up. The band sure can perform, and their musical output didn’t differ that much from the two other bands of the evening, but the audience’s reactions throughout the set were surprisingly lame. I guess this is something that, like One Morning Left, one isn’t just supposed to like? I caught a hilarious piece of conversation in the bathroom after the show: “I always try to find something good about everything, but I just didn’t get anything positive out of that band!” This actually completely proves that Blind Channel knows exactly what they’re doing, and because of it you definitely should go and see the band, even just once – Blind Channel disregards traditional heavy music conventions and makes music that only sounds like themselves, combining the sound of early 2000s American metal, pop-influenced choruses, and Niko Moilanen’s and Joel Hokka’s rap verses. 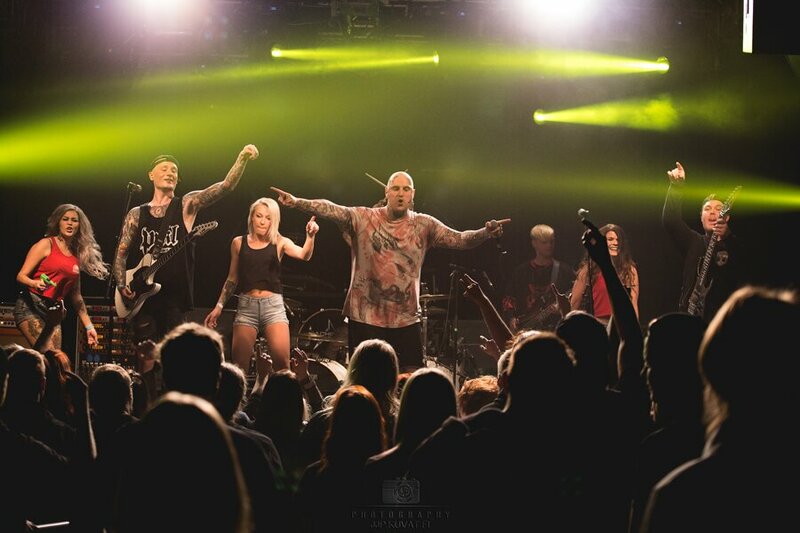 The band also has talent when it comes to cover songs – the set contained both “Don’t” by Ed Sheeran and “Can’t Hold Us” by Macklemore, and without knowing the originals, one couldn’t have guessed that either were covers. 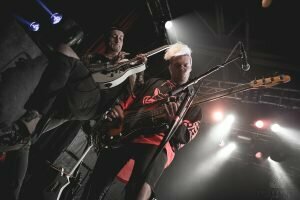 By the end of the show the audience seemed to be warmed up to the extent that Moilanen managed to ask everyone to squat, and at the beginning of their latest single, “Alone Against All”, to jump back up. In the end, the deal’s the same as with One Morning Left: I probably wouldn’t listen to this at home, but I’d watch a show any day! 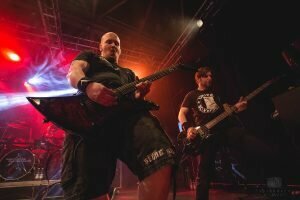 Lately I’ve watched Nosturi shows behind the mixing booth, but Machinae Supremacy is such an important band that I had to move closer to the stage. I think I’ve seen almost ten of their shows in Finland, and so far none of them have been anything less than excellent. At half past ten, the curtains were pulled aside and the show began with “My Dragons Will Decimate” and “Into the Night World” off the new album. Right after that, the band pulled a surprise by playing “Player One” from their commercial debut, Deus Ex Machinae. DE-CENT! I remember, probably at the 2010 Nosturi show, being bummed that Machinae Supremacy doesn’t play their old classics anymore, as their fame is so cult-like that the audience surely would know all the songs anyway. Two years later, after the release of Rise of the Digital Nation, I came to the conclusion that who really cares – it doesn’t matter what they pick for their setlist, because every song is a sure hit. Over the years, Rise of the Digital Nation and 2010’s A View from the End of the World have clearly formed the backbone of their live shows, because missing out on songs like “Force Feedback”, “Nova Prospekt”, or “Rise of the Digital Nation” would feel downright weird these days. 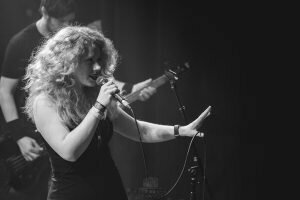 The new album was featured with great choices, as “Twe27ySeven” and “The Last March of the Undead” worked excellent live – before the former, the band invited Ingeborg Ekeland, the female voice on their records, back to the stage. The self-proclaimed party song of the set was, less surprisingly, “Indiscriminate Murder is Counter-Productive” – I think I’ve seen one MaSu show after the release of A View from the End of the World during which it wasn’t played. Machinae Supremacy’s encores have always had a good deal of variety – this time ”Rocket Dragon” and ”Dark City” were heard before their de facto show closer and greatest hit, Redeemer’s “Through the Looking Glass”, again featuring Ekeland on additional vocals. A great set, and how good did the band sound! The mix was clear and Robert Stjärnström’s vocals had the perfect volume, and in addition the man pulled off his best performance in years – the first YouTube clips after the release of Into the Night World had made me expect slightly rocky vocals, but Stjärnström held his pitch flawlessly. The band’s line-up has been the same for several years now, and the players have clearly become a tight unit, with their performance turning out to be as sturdy as one would expect. Though unexpectedly, the guitarist Tomi Luoma had shaved his head – I could’ve sworn that I saw him on the side balcony with his hair ON during Blind Channel! MaSu is an extremely important band in their effect toward bringing all the nerds closer to one another. They have also worked on behalf of music’s free distribution over the internet, since the band has encouraged their fans to share their music over peer-to-peer networks for over 10 years now. Their old releases are still freely available via their website. 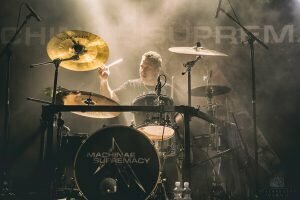 On top of all this, Machinae Supremacy is musically unique, and their material easily holds up in comparison with much bigger metal bands. I’ll see you guys next time – I wonder if “Winterstorm” might finally be included in the set then? 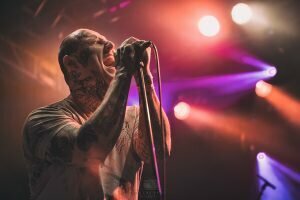 Next articleRotting Christ to Play Two Gigs in Poland!